The Raise Foundation’s Young Professionals Board: "The Kids Table"
Looking for networking opportunities? Want to help make a difference in your community? Interested in building your resume? Then this is the group for you! The Kids’ Table is a group of young professionals working with The Raise Foundation to help strengthen families. They believe that every child deserves to grow up in a safe and healthy home. 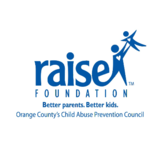 They come to the table once a month on behalf of kids; planning fundraising events, basic needs drives and awareness campaigns to support the work that The Raise Foundation is doing in Orange County.